means. Reverse engineering, disassembly, or decompilation of this software, unless required by law for interoperability, is prohibited. them to us in writing. 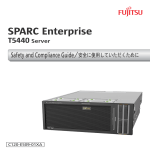 If this is software or related software documentation that is delivered to the U.S. Government or anyone licensing it on behalf of the U.S.
registered trademarks of SPARC International, Inc. UNIX is a registered trademark licensed through X/Open Company, Ltd. This software or hardware and documentation may provide access to or information on content, products, and services from third parties. or use of third-party content, products, or services. installing a Sun Microsystems product. On – Applies AC power to the system. Off – Removes AC power from the system. the equipment’s electrical rating label. the equipment. Dangerous voltages may be present. 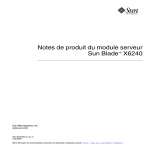 regulatory compliance of a modified Sun product. product near a radiator or heat register. Caution – Hot surface. Avoid contact. personal health, follow the instructions. instructions inscrites sur le matériel. trouver en présence de hautes tensions dangereuses. risquez de vous blesser si vous les touchez. sur la position de veille. place avant de mettre votre système sous tension. Wartezustand – Der Ein-/Standby-Netzschalter befindet sich in der Standby-Position. Kurzschluss verursachen, der einen Brand, Stromschlag oder Geräteschaden herbeiführen kann. Systems die Gehäuseabdeckung wieder an. Geräteschaden. Befolgen Sie die Anweisungen. Ein – Versorgt das System mit Wechselstrom. instalar un producto de Sun Microsystems. está en la posición de espera. descargas eléctricas o daños en el equipo. pueden causar lesiones personales si se tocan. not installed and used in accordance with the instruction manual, it may cause harmful interference to radio communications. granted to the user by the FCC to operate this equipment. installing network hardware and software. based on Mellanox Technologies’ MT26428 ConnectX IB adapter (HCA) device. Details on locating specific manuals at this web site are provided in Chapter 3.
goods, or services that are available on or through such sites or resources. of the device, while connector 2 connects to Port 2.
supports external InfiniBand active copper and fiber solutions. bus operations, or a slave responding to PCI bus operations. LEDs for each 4x port. See FIGURE 1-3. The pair of LEDs for each port have the meanings described in TABLE 1-1.
other end of the cable. The ExpressModule receives power from the server or workstation slot connector. All other required power is generated by ExpressModule switch-mode regulators. For power consumption see Appendix A.
uniquely identifies this device in the server and on the IB fabric. number 820-6540. This document is available at http://docs.sun.com. Adapter PCIe ExpressModule and verify that it has been installed correctly. 1. Halt and power off your system. edge connector into the connector on the chassis. Ensure that the connectors are properly engaged. the cable near the connectors and avoid cable bends of more than 90 degrees. ports on the InfiniBand switch. 5. Turn power back on to the system and allow the server to reboot. With Linux” on page 20. Use the following procedure to hot-swap the ExpressModule with the Linux OS. SuSE Linux SLES10SP2 hot-plug procedure. Where n is the instance number of the ExpressModule. 4. Press the Hot-Swap button on the ExpressModule (see FIGURE 1-3). physically ready to be removed from the chassis slot. indicates the driver is stable. 6. Insert the ExpressModule into chassis slot. stack for the Solaris OS and Linux operating system. SUNWhermon. The driver name is hermon. subsequent Solaris Update releases must be used with this IB-HCA ExpressModule. the Sun Dual Port 4x QDR IB Host Channel Adapter PCIe ExpressModule. to the installation instructions in the package README file. Note – This command must display version number 1.9 or higher. power on the server, and cable the server to an operational InfiniBand switch. 1. Ensure that the cables are connected to the adapter and switches. Refer to the manual for the IB Subnet Manager for more information. 5. Verify that the IB-HCA ports are up and the driver is attached. a. Use the cfgadm(1m) command to obtain the state of the device installed. pages for details about the IB specific extensions. b. Use the cfgadm(1m) command to obtain port GUIDs for each port on the IBHCA. device in the following step. configured by the Subnet Manager. ExpressModule being installed. See “Node GUID” on page 5.
firmware. Once installed, reboot the system to enable the new firmware. the Solaris 10 System Administrator Collection available at http://docs.sun.com. to set up upper layer protocols such as IPoIB and uDAPL. OS with your IB-HCA card. Manager in the partition where the IPoIB link will be used. 2. Select the Products tab. 3. Select InfiniBand SW/Drivers from the menu for Products. 4. Select Linux SW/Drivers from the menu for InfiniBand SW/Drivers. 5. Select the download that corresponds to your operating system. Follow those instructions to complete the download. 6. Select and download the related documentation for MLNX_OFED. except for a difference explained in the next step. mlnxofedinstall script, always include the --without-fw-update option. Stack for Linux User’s Manual. 3. Select Boot Over IB from the menu for Products. Follow the instructions provided on the web page to complete the download. that is connected to the fabric. or on a host within the subnet. 1. Ensure that the cables are connected to the ExpressModule and switches. The port is not working or the cable is not connected. http://OpenFabrics.org) and your current vendors. drivers (and other software components) to OFED. * The auto-negotiation protocol is proprietary of Mellanox Technologies and compliant with the InfiniBand Architecture Specification, Release 1.2.